Ibroxnoise.co.uk is proud to announce we are an official agent of Rangers Lotto which encourages loyal Rangers supporters to sign up for a weekly stake in Rangers Lotto. It is a Direct Debit scheme at only £1 a week which will not only stand all entrants in with a chance of winning thousands, but will benefit Rangers' Youth Development Company exclusively with all Lotto proceeds going directly into funding the Barry Fergusons, Alan Huttons, Barrie McKays and Lewis Macleods of tomorrow. All Rangers Lotto profits fund our youth teams. Your valuable support will help us to provide the funds for our future. 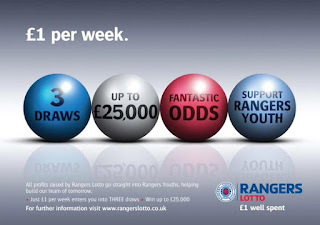 Rangers Lotto is a weekly game based on the National Lottery.For £1 you are given 4 numbers. If your 4 numbers match the first 4 drawn in the National Lottery then you have won the Jackpot, which is anything up to £5,000! How can I play the Rangers Lotto? Direct Debit – simply fill out our D/D form, we’ll collect £1 per week from your account (or however many entries you would like per week) and we’ll ensure you’re entered into our weekly draw – it’s as easy as that! To download a form click here. Lotto Agent – you can become an official Lotto agent where you can bring on board lotto players, earn 12.5% commission for every £1 you bring in AND take advantage of the many other benefits exclusive to Lotto agents only. For more information click here. Play online – to play as a one off player you can play online. Click here to buy your Lotto tickets now! How do I win with Rangers Lotto? Saturday Draw: If your 4 numbers match the first 4 drawn in the National Lottery then you have won the Jackpot, which is currently anything up to £5,000. If the Jackpot is not won outright then 3 numbers plus the bonus ball wins. If no Jackpot combination is won 3 numbers share the jackpot! Wednesday Draw: If your 4 numbers match any of the first 5 drawn in the National Lottery then you have won the Jackpot of £1,000. Monthly Rollover Draw: If your 4 numbers match the 4 numbers randomly generated from the Rangers Lotto system then you win the rollover amount for that month. You don’t need to do anything! We’ll have collected your address details when you buy your Lotto ticket so we’ll send your winning cheque out to you within 10 days of your winning numbers coming up! What perks are there to playing the Rangers Lotto? Whether you play the Lotto via direct debit or as an official agent you can subscribe to our monthly newsletter for up-to-date information and monthly competitions. Your £1 per week enters you into 3 draws. You must be over 16 to play Rangers Lotto. All profits from Rangers Lotto support our Youth Teams and I hope you agree this is a worthwhile cause. Your cash will be going into Rangers Youth Development Company, not Ibroxnoise.co.uk - we will receive a small 12.5% commission as agents based on registrations through our agent number, cash which will only be used to help run this site if required.